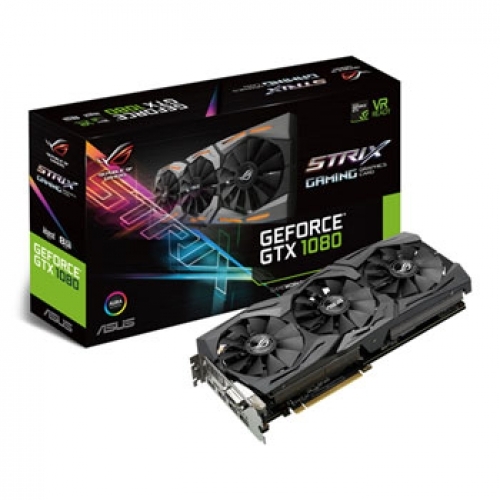 Product Description ROG Strix GeForce® GTX 1080 gaming graphics cards are packed with exclusive ASUS technologies, including DirectCU III Technology with Patented Wing-Blade Fans for 30% cooler and 3X quieter performance, and Industry-only Auto-Extreme Technology for premium quality and the best reliability. Aura RGB Lighting enables a gaming system personalization and VR-friendly HDMI ports let gamers easily enjoy immersive virtual reality experiences. ROG Strix GeForce® GTX 1080 also has GPU Tweak II with XSplit Gamecaster that provides intuitive performance tweaking and instant gameplay streaming.